The Secular Franciscans of Our Lady of the Pearl participate in the ministries of the community and in their parishes, especially with Adoration, singing in the choir, working with youth of all ages, teaching CCD classes, the food bank, working in the church library and serving as Eucharistic Ministers. Donations are made by our community to other ministries and to the poor. The blessings and graces that the Almighty God has bestowed upon this small group has been truly humbling and amazing. Through the guidance of Saint Francis, the Blessed Mother and her Spouse, the Holy Spirit, we have been able to carry the word of God, not only into our neighborhoods here at home, but into other parts of the world. We live by faith, open to the opportunities that God presents to us. Mother Angelica says, “If you are following God, He never shows you the end. It’s always a walk of faith.” It has been an awesome experience to follow the Lord through an open door, not knowing what is beyond or where it will lead . It has been awesome to surrender to his Holy Will and watch his plans unfold as he uses us (simple, ordinary people) to achieve some good not thought possible. At the beginning, the call for our fraternity seemed to be in the area of communications and to follow the lead of Pope John Paul II to use modern technology (an area we knew nothing about) for our faith. We were blessed to host Father Benet A. Fonck, OFM, in a two-day conference at Our Lady of the Gulf, Bay St. Louis, Mississippi. 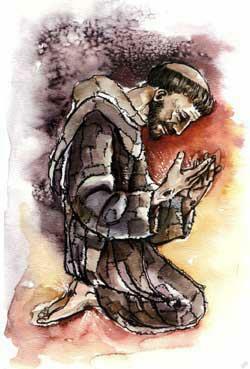 This lecture series was entitled “Saint Francis, The Man Behind the Bird Bath,” on Saint Francis, his life and work. The lectures were professionally recorded, and we experienced our first efforts in the production and national distribution of CD’s and tapes. The web designer for this website and others was done by one of our members with no previous knowledge and experience in web design. She is self-taught, learning through reading, trial and error. Her first web site was for Concordia Ministries, Inc., a ministry originating out of Our Lady of the Pearl for Catholic radio. Our sister Patty Palmer, OFS (deceased), was a member of St. Joseph’s Catholic Church, Poplarville, MS. She gathered others at her home every fall to string beads and make beautiful jewelry. It was sold at her church’s annual art show and church fair in October as well as other juried art shows. Profits from the sales were given to her church’s building fund for a new church. Our community raised money for an Adoration chapel in Chile. The funds were personally delivered to the Bishop in Chile by one of our members. One brother made a mission trip to the Amazon for Amazon Relief, ministering to the poorest of the poor and those with leprosy. He has also gone on several Guatemala Music Missions with Franciscans from Canada and other locations. Our Franciscan Brothers in Mexico assisted and helped organize the Mission. One sister assisted with the start of Bible studies at St. Joseph Church, Pearlington, and for years, another sister taught a Bible study class in her home every week. Others started a 12-step program which met weekly. Another collected used clothing and baby items for the Crisis Pregnancy Group in Covington, LA, to provide for young mothers who need assistance. One member took the H20 Project to Catholic schools in our area to raise money during Lent. This is a national Franciscan Youth fundraiser to help create clean water by drilling of clean water wells for those most in need. Money is raised by giving up purchase of beverages for two weeks, drinking only water, and contributing the money. As a result of our member taking the H2O Project to the schools, $3869.53 was raised and credited to St. Joan of Arc Region. Of this amount, $1,250 was designed to Mercy Ships and $2,619 to the poor of the village of Cochabamba, Bolivia, South America. Several members were the incorporators of Concordia Ministries, Inc., and served on its board. Concordia focused on evangelization and bringing Catholic Radio to the Mississippi/Louisiana Gulf Coast. Our Rule states: “Moreover they should respect all creatures, animate and inanimate, which bear the imprint of the Most High, and they should strive to move from the temptation of exploiting creation to the Franciscan concept of universal kinship.” In this regard, one sister was a foster mom for Northcentral Maltese Rescue, Inc., a Maltese dog rescue organization, caring for surrendered or abused and neglected dogs until they are well and ready for adoption. In October one year, Our Lady of the Pearl held a Transitus service for the public and issued invitations through Gulf Pine Catholic and e-mails to all the parishes in our Diocese. Members from three other fraternities joined us as well as members of the public. Another member, L. J. Reiss, OFS (now deceased), assisted for many years with funerals at his church in Picayune MS and also with Mass each day. He always prayed for the Poor Souls in purgatory. In the fall and winter of 2012, our fraternity sponsored a coat drive for those affected by Hurricane Sandy in New York and surrounding areas. Many churches and others participated in the drive and helped Our Lady of the Pearl, a Secular Franciscan Order, collect and ship more than 2,400 pounds of coats. Home Depot in Picayune and Lowe’s Home Improvement Store in Bay St. Louis also helped, sponsoring the shipment of more than 50 boxes, either by shipping the boxes in a company truck or sending them by commercial shipment. Especially since August 2005, one of our strongest ministries has been to comfort, support, pray for each other and others and to continue on through tragedies. In doing so, we testify to the world that God is great, God is good, full of love and mercy. In 2005, when Hurricane Katrina came to Southern Mississippi, all members suffered great damage to our homes and other properties. Some members lost their homes down to the slabs; some moved away; some had lifestyle changes which resulted in their not being able to participate in the fraternity.